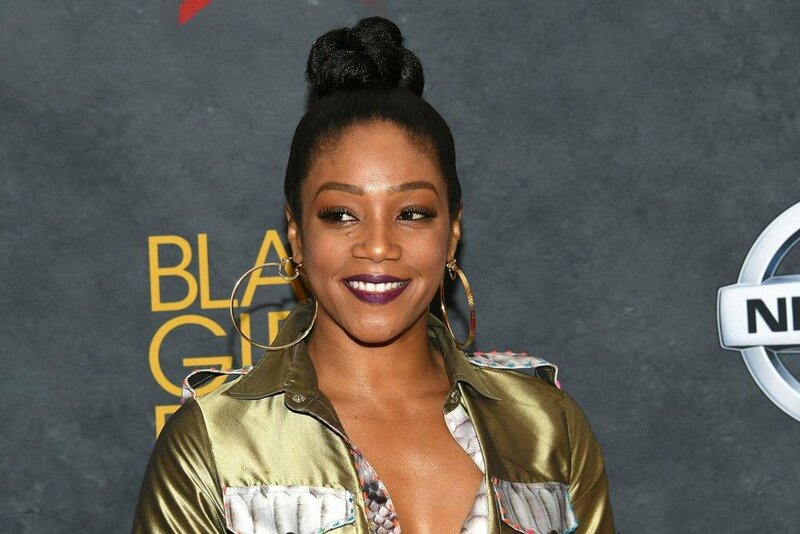 As soon as you hear the name Tiffany Haddish, heads start turning. Hell, at least I know my head does a whole 360. Whether her name rings bells from her starring role in 2017’s Girls’ Trip or her big debut on Saturday Night Live, her journey doesn’t stop now. It’s always been a bit difficult for women, especially women of color, to bask in their success without the scrutiny from others. Since her youngest days, Haddish knew that ‘making people laugh’ was something she was passionate about, considering her past. Haddish has been extremely open and forthcoming about the details of her past. She was brought up in a series of foster homes throughout the South Central area of Los Angeles, resulting from no real family experience; but then one day, her life changed. After repeatedly getting into trouble at school, Haddish’s social worker gave her an ultimatum: attend the Laugh Factory Academy Camp or psychiatric therapy. I mean, what would YOU choose? It’s a no-brainer that she’d choose something she knew she was passionate about and from then on, her life began shining. After eventually choosing the Laugh Factory Academy Camp, she was taught how to build and maintain confidence, read and write, and have an unforgettable stage presence. Her social worker’s decision to give Haddish an ultimatum helped shaped her life. Let’s face the facts: Tiffany Haddish has been living her best life the entire year of 2017. From her starring role in NBC’s The Carmichael Show, to her role in pushing Girls’ Trip to the top of the charts, to her first stand-up comedy show—Tiffany Haddish: She Ready! From the Hood to Hollywood—featured on Showtime, to being the first black female comic to host Saturday Night Live. That’s a BIG deal. Why? In our world today, it’s not only difficult to be a woman, but to be a black woman? A black woman in comedy? A black woman in comedy who is surpassing all that she has endured? That’s why it’s a big deal. No matter what, women—especially black women—are held to a higher standard. For example, Tiffany has both been praised and disdained for who she is—an African American woman comedian. Some say she has paved the way for black women who are on a journey towards the betterment of their lives, while others say she’s loud and chaotic. Because she’s a black woman upholding her role as a comedian in a world where black people are always under attack and scrutiny, people have high expectations of her...thus creating a sense of discomfort. Constantly looking for reasons to shame a black woman, even in the event of her rising success, displays pure issues with blackness in America. It’s no secret that anti-blackness in America is prevalent. But being a black woman in entertainment? Beating the odds? Upholding success that white people expect only themselves to achieve? Shoot… Let that marinate. Conveniently judged by what she says and what she does, Haddish still manages to leave all negativity in the backseat. Women are the backbones of America. We’re creators, nurturers, magical unicorns. We should be able to rise to success, embracing the very thing that people worked hard to keep away from us. Question: While you’re on this rise to the top, we know that it’s difficult for black women to truly become comedic superstars. Do you think of that as you’re navigating the industry? Haddish: No. The only thing I think of when I’m doing my job of being funny or working on these shows is, “How can I deliver my message in a way that will stick with people?” Every teacher that I’ve ever had, that I still remember their name, made me laugh. I feel like comedy is the best instrument to teach. Since then, Haddish has blossomed as a comedian, gaining more momentum. She’s managed to build new bonds and develop new relationships, as well as new up and coming roles. Among the many relationships she’s built, the one she has maintained with Jada Pinkett & the Smith family has raised many questions. It’s almost like folks couldn’t believe Tiffany Haddish could form a significant bond with Jada Pinkett Smith. Ever since news broke about their new-found friendship, Jada Pinkett and Tiffany have been inseparable–constantly raving each other on. I’d like to call that Black Girl Magic–black girls and women supporting and uplifting one another while living in a world full of hate and jealousy. As black women, we already push ourselves ten times harder; why not help each other?